A nice short one today. Who was Sun Tzu? What was his career like? Did he actually write the famous book attributed to him? Did he ever exist at all? All these questions and more are ones that I, and many others, will never come close to answering conclusively. But, what we do know, is that Sun Tzu is part and parcel of military education, and has been for a period of time that is truly astonishing. 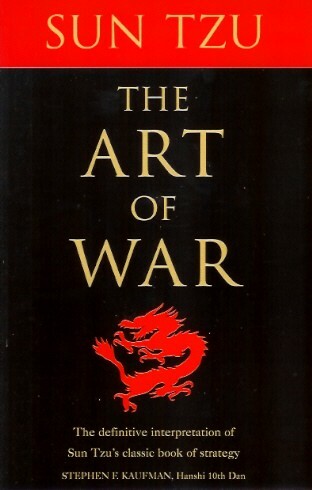 Thousands of years and so many RMA’s have been and gone since Sun Tzu – or someone maybe – wrote down “The art of war is of vital importance to the State” and still the book finds itself on all of the recommended reading lists, a text that officers and others are expected to read, consume and remember. It has transcended the military world and is used as a treatise in law, business and even sport, any environment which involves some form of competition. This might seem confusing when you actually sit down, for no more than an hour and a half, and read the remarkably short text, which is made up of clipped sentences within thirteen headings. And the reason that it might seem confusing is that everything is so simple: The Art Of War is the idiots guide to conflict, the most basic textbook for how to command troops in battle and how to win wars. Cheers for that General Tzu, I never would have figured that out for myself. So much of The Art Of War is like this, that there is an element that dismisses its usefulness entirely, as on overly simplistic bit of historical knowledge, which has little relevance to the modern world or the modern way of carrying out war. But there is use there, for a variety of reasons. Aside from the neat way that The Art Of War has survived through the ages, literally one of the oldest textbooks on war ever written or preserved, there is the simplicity of it, which has a positive connotation as well as a negative. No one would seriously suggest that a reading of The Art Of War would prepare someone for generalship. But there is something endearing about how the book boils away all of the fluff, all of the complication and all of the complexity, to come up with the very base guidelines that we have to take into account. Sometimes, simple is best, and nothing is more simple than The Art Of War. In being that simple, The Art Of War is easily remembered and easily absorbed: where someone like Carl von Clausewitz needed hundreds of pages and a confusing dialectic approach, Sun Tzu just needed a short bit of time and a small amount of ink to make many of the same points (or better). And there are the deeper parts too, which require closer examination: Sun Tzu actually abhors war as a practise, and insists it be the last resort of a nation, he emphasises the virtues of manoeuvrability and surprise over brute force, he insists on the power of knowledge over the power of a sword, he encourages restraint and mercy in any general, and in some of the most pertinent parts of the book, he expands on how deception and subterfuge, not bloodletting and violence, are the key elements in determining battles and wars. Attack when strong, do not when weak: but also appear inactive when active, incapable when capable, hungry when fed, unprepared when ready. Treat your men well and don’t throw their lives away needlessly, and never pick a fight you know you can’t win. I wouldn’t say that The Art Of War taught me a great deal directly, but it did make me think about war in more simplistic terms than I had before, eschewing complexity and layered analysis. Sometimes it is good to take a step back and survey a war with such an eye, to look for mistakes made at that basic level. For that, The Art Of War is still a great text, and so remains as it is, one of the benchmarks of military education. This entry was posted in Books, NFB Reading List, Reviews, War and tagged books, reading list, reviews, sun tzu, the art of war, war. Bookmark the permalink.